Why is the medal so important? St. Padre Pio was known to pass around Holy Face Medals saying "This is your entrance ticket to Heaven." 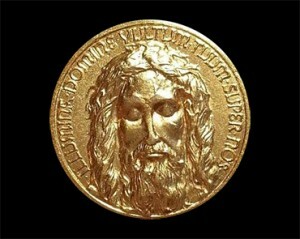 The medal became famous for the miracles and spiritual favours associated with its use. In Our Blessed Mother’s own word, the medal is “a weapon for defense, a shield for courage, a token of love & mercy in these troubled days of lust, evil, loss of faith and hatred for God and for His Church. The blessed medal will be sent to you from the village of Knock, Ireland where our Lady appeared in 1879. Please enter your details below and we will post you a blessed Holy Face Medal and chaplet booklet. €2 for Republic and Northern Ireland. €4 for all other countries (Worldwide).